In 1866 the Annexation Bill was a bill introduced on July 2nd 1866, but never passed in the United States House of Representatives. It called for the annexation of British North America and the admission of its provinces as states and territories in the Union. The bill was sent to committee but never came back, was never voted upon, and did not become law. The bill never came to the United States Senate. Purchase of the Hudson’s Bay Company’s lands for $10,000,000. Take over provincial debts which amounted to $85,700,000. Give an annual subsidy of $1,646,000 to the new states. Connect Canada with the Maritimes by rail and spend $50,000,000 to complete and improve the colonial canal system. Map of the alternate United States if the Annexation Bill of 1866 had passed. 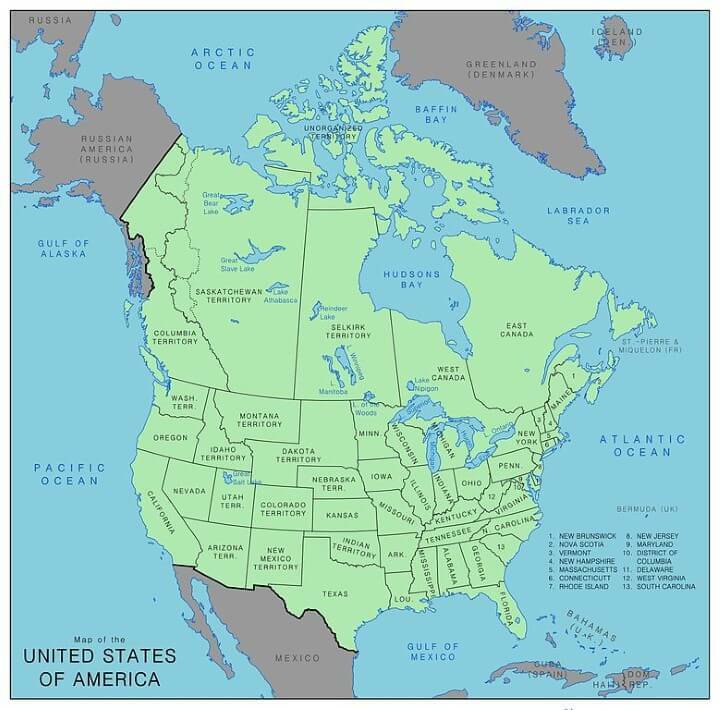 This map was made by Rubberduck3y6 from AH.com and a good article to read about is The United States If The Annexation Bill of 1866 Had Passed at Brilliant Maps website. Canada East: Modern-day Quebec, Newfoundland and Labrador, and part of modern-day northern Ontario. Canada West: Modern-day southern Ontario, and part of modern-day northern Ontario. Saskatchewan Territory: Modern-day Alberta, and parts of modern-day Saskatchewan, British Columbia, the Northwest Territories and Yukon. Columbia Territory: The part of modern-day British Columbia west of the Rocky Mountains.